Although creating Android Parcelables is usually at least 10x faster than using Serializable, creating Parcelable objects requires creating a lot of boilerplate code in defining exactly the stream of data that should be serialized and deserialized as documented in this section. While there are IDE plugins to help facilitate the creating of these objects, another option is to leverage a third-party library called Parceler that will help automate this work. Underneath the surface this library generates the necessary wrapper classes for you at compile time automatically, saving you the repetitive steps required for leveraging the performance benefits of Parcelables. Make sure to upgrade to the latest Gradle version to use the annotationProcessor syntax. Remove the Serializable interface back to its original form. Annotate the class with the @Parcel decorator. Use only public fields (private fields cannot be detected during annotation) that need to be serialized. Create a public constructor with no arguments for the annotation library. 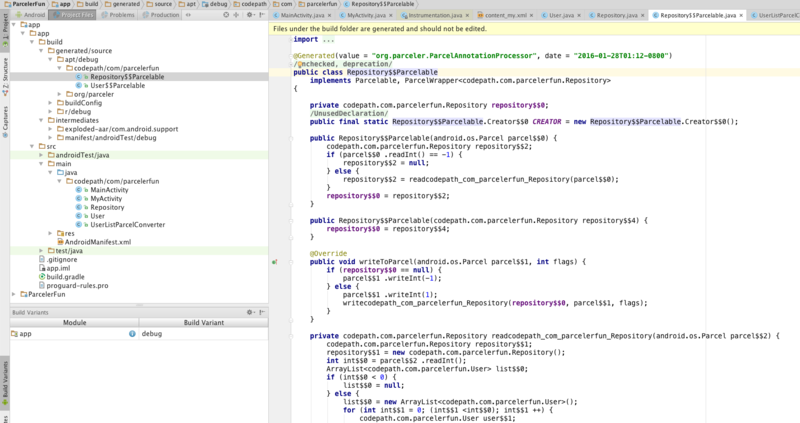 The Parceler library works by using the @Parcel annotation to generate the wrapper classes for you. It works with many of the most standard Java types, including the ones defined here. You can also look at your app/build/generated/source/apt directory to see how it generates these wrapper classes. Parceler essentially handles the steps described in this section. In this case only parameters from User class will be serialized avoiding any fields from BaseModel. Getting java.lang.ClassCastException: SomeObject$$Parcelable cannot be cast to SomeObject when extracting a Parcel from a Bundle? Getting a null exception when accessing a member instance stored within a Parceler object? Be sure that all custom java objects stored as fields within a Parceler object are themselves also Parcels. Make sure that every parceled field is properly converted into a Parceler object. Breakpoint at the point right before the object is being wrapped and verify the member field is correct. Breakpoint again at the point right after the object is extracted and unwrapped and verify member field is correct.